Meet my latest vintage creation, the Vintage Vogue 5557 sheath dress. I think this can be described as a sheath dress, VintagePatternsWiki describes it as a one piece dress but given the simple lines it is certainly close to a sheath. I bought this pattern a little while ago as one of many from a local seller who was selling off his mother’s patterns from when she was a seamstress. 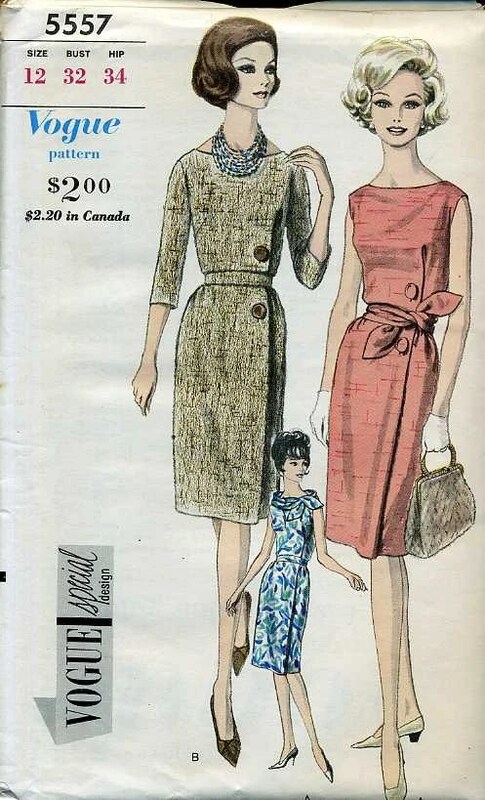 One of the reasons I was most excited about getting these patterns was that they were all used, showing they were a real part of fashion of the era. This particular pattern is dated to June/July 1963. The pieces were all shortened (perfectly) and had been narrowed across the back. For me these are two of my standard alterations. The only thing left me to alter was to “grade” it up to my size. When I say grade, I mean just add a bit to the side seams, after all it didn’t need much altering as most of it had already been done! The dress has a fake pleat/wrap with fake button closure. It has bound buttonholes, which are completely wasted as they are covered from view with the buttons that are sewed over the top of them. The buttonholes are real on the very top layer, but underneath there isn’t a hole at all! The dress is actually closed with a side zip. Other than the fact I love this dress, I also made the whole dress from my stash – so really it was free right?? – The dress is supposed to have facings, but I am not a fan of how they seldom stay where they should so I fully lined the bodice with a remnant of cotton from a previous project. The dress went together pretty well and not much fiddling with the fit was required. The only big difference with the fit was that the pattern envelope indicates it is more blousey at the bodice, I prefer a little more fitted which is good as that is how it ended up!! I love vintage instructions, the diagrams are brilliant. Now I don’t know about you, but there is no way my waist is close to my neck size. I tried it to see how it would look, but am really not a fan. Hmmm…where is my neck? Not a good look, and where is my waist? Not loving it. Nope I give up, I’m keeping the belt. I have already worn this to a couple of functions, so another wardrobe winner, and great for the festive season. Such a good-looking dress. Well done! and I still LOVE your hair. It's gorgeous! I love, love,love this dress. It is my favorite color and the pattern is fantastic. I want that pattern.. GORGEOUS!!! It looks great on you, isn't it amazing that the pattern was just meant for you.. Just think of the lady, who fixed it.. Love it. Awww what a pretty dress. :)Also congrats on being the winner on Kestrel Finds and Makes. How exciting! Great dress! Agree that the scarf is better as a belt, it finishes the whole thing off so nicely! Thanks – you can have the pattern if you like – perhaps we could arrange a swap if you are interested?? That looks just the shot for some Christmas partying. Lovely work. It's gorgeous!! And it seems that the pattern was just waiting for you to find it. I agree that the belt works better as a belt, it all just looks too bulky as a scarf. Thanks!I am so excited I won the vintage patterns – now I just have to decide!! Thank you, yeah the scarf idea was silly – never going to look good. Perfect Xmas party dress, it has already been on a couple of outings and is destined for more! Thank you. This pattern has worked out really well, I love when it all works out well. Agreed much better as a belt, plus helps define my waist. Wow this is such a pretty dress a definite wardrobe winner!! You look really pretty and perfect for over the xmas break (love your hair!)! I like the version as a belt but still very surprising you can do the collar as well hehe. Looks really well made too I love the buttons and the lining!! I like the belt option better too, it defines your waist very nicely. I love a faux button hold pleaty thing, sometimes buttons running down that much length can be problematic, popping open or showing a peak 😉 I have the Colette Beignet skirt pattern that has buttons down the front and when I make it up I will make them fake and put in a zipper. You look fierce, Lizzy! Well done! The belt is super cute and I think adds the finishing touch to this! I love the red and doubles as super festive too. It is fun to wear, but no good if I want to be a wallflower! The faux button thing is good, doesn't end up with any wardrobe malfunctions. I have to be careful with my Kelly skirt sometimes for that reason! Yes, yes.. I would love to swap with you..or I will buy it from you.. I love, love love this pattern..Just let me know your ideas. Definately the belt rather than the scarf, although that looks good too. Gorgeous dress. You look wonderful in your Vogue red dress. I like the belt best!!! Thank you very much, agree on the belt, I will never do the scarf again, promise! Thanks, I am loving this dress, now if only it wasn't currently too hot to wear it!! Thank you, thank you, thank you 🙂 Such lovely praise. This is absolutely adorable! I love it!! So chic! Why thank you! I just realised this probably belongs on my top 5 too, gah, only room for 5!! What a beautiful dress. I was just reading about it on Judy's blog! It looks stunning on you. I love the crisp look of the fabric, very elegant and timeless! Beautiful dress, how can I get that pattern? I would suggest looking on etsy. I no longer have it sorry.